The first race of NASA's 2010 Western Endurance Racing Championship series is in the history books. Some cars were victorious, some cars died, trophies were distributed and post-race beer was consumed. The best race of the weekend at Buttonwillow Raceway Park was the E3 class with the entire podium finishing on the same lap. First and second were seperated by a mere 15 seconds after three hard hours of racing into the darkness. Team Full of Blarney in the number 41 Mazda Miata took E3 first place honors with Brady Flaherty driving the entire 3 hour stint solo. He was sponsored by RJ Racing. His Miata ran out of gas on the cool down lap with Krider/Kramer Racing breathing down his neck at the finish. Keith Kramer and Rob Krider finished second after leading a good portion of the race but had to do a late race splash-and-go for fuel (giving up their lead) in their number 33 gas-guzzling Nissan Sentra SE-R sponsored by Hoosier Tires, I/O Port Racing Supplies and ST Suspensions. Not too shabby for a LeMons team (no they didn't roll over this time at Buttonwillow). The team's success is owed 100% to their outstanding pit crew. 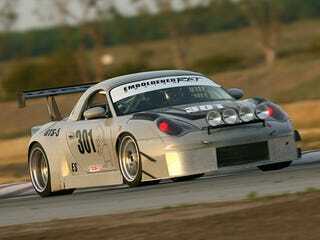 The number 512 Porsche of Team 944 Elite held on for the final podium spot in E3 39 seconds from the leader. This class was dominated by those crafty Germans. First place in E2 went to the number 6 BMW of Team South Bay Independant. Second place in E2 went the number 510 BMW of Team Blag Flag. Joining the Germans on the E2 podium was the number 431 Ford Focus of Team Lack of Focus sponsored by F2Focus.com. The team replaced a right front axle during the race and still picked up a trophy. As we work our way down the results here the cars get a bit faster. First place in E1 goes to Team Z3 in their number 731, yup you guessed it, Z3. Second place in E1 goes to Team Speedy Motorsports in their number 43 Honda which lost its front bumper somewhere along the race. Finishing 3rd in E1 and proving that an Acura Integra head gasket can last at least 3 hours is number 5 Team Diva Speed. Yes, many people in this race were beaten handily by a girl, well a diva, I should say. This class is filled with teams that spent a few bucks building their awesome cars, and then have the lack of sense to run in a race with six other classes -other classes that didn't spend as much and don't mind rubbing a little paint. What's a 1991 Nissan Sentra fender go for? 20 bucks tops? What does the rear bumper cover on an M3 go for? I don't know but I "ran into" a team that is about to find out. Grabbing first in E0 went to the number 95 BMW of Team Bullet Performance. They also finished third overall. Team Andiamo in their number 51 BMW, sponsored by Jagermeister, snached second in E0. I hung around their pits but no luck, they weren't handing out free samples of Jager. The final podium spot in E0 went to the number 32 BMW of Team WolfKatz. This class set the pace all race long and would blow your doors off and rupture your ears as they motored by all night. Taking the prestigious overall win and the ES win was team Emboldened Rat Racing in their wicked number 301 Porsche Boxter on steroids. Second overall for the event and second in ES was Team Super Truck in their... super truck -a Chevrolet S10 without many (if any) Chevy S10 parts. The number 66 monster ran hard and finished on the same lap as the Porsche. Team Prototype Development took their number 4 Factory Five concoction and brought home the 3rd and final trophy spot in ES. Team Green Alternative Motorsports set the pole with their super fast number 88 prototype racecar. I think they were also the first with a mechanical issue. Coincidence? I'll let you decide. I bet a guy $5 at the start that their car wouldn't finish the race, and it didn't. I'm still waiting for my 5 bucks. But good news, since nobody else ran the ESR class, the team won! At the NASA WERC 3 Hour Enduro at Buttonwillow, everybody was a winner. Great racing and a good time had by all. We just need to get that Jagermeister team to bring some free hooch next time. Photography by Steve Happel of Vanhap Photography. Teams wanting photos can order them from www.vanhap.com.